It is sunny and mild, mid 70's with a slight breeze. In other words, a typical Southern California day. What is not typical is what is going on around city hall. 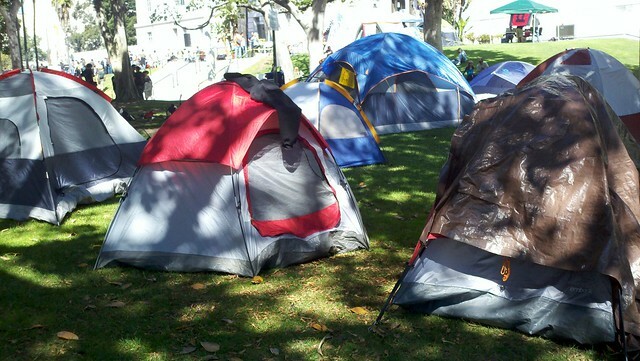 Hundreds of tents have been set up on both sides of city hall. In the morning work shops were meeting at various locations in the city hall park, musicians were playing at different locations and someone was leading an exercise group. Over 300 protesters stayed in the Occupy Los Angeles encampment last night to support their brothers and sisters in Occupy Wall St. and today many hundreds more are wandering around, most making their first visit to Occupy LA. It always feels like Spring in Los Angeles but lately, it's been feeling like the Arab Spring. 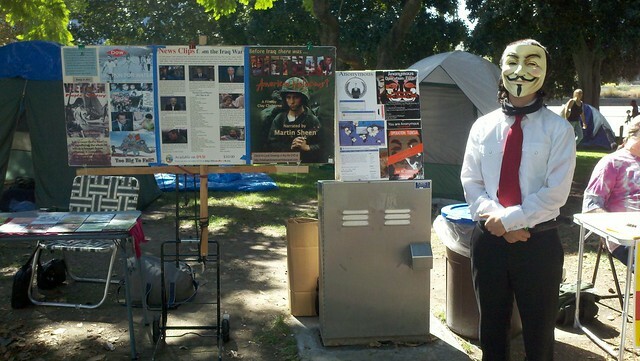 Saturday was a huge day here as Occupy Los Angeles enters it's second week. 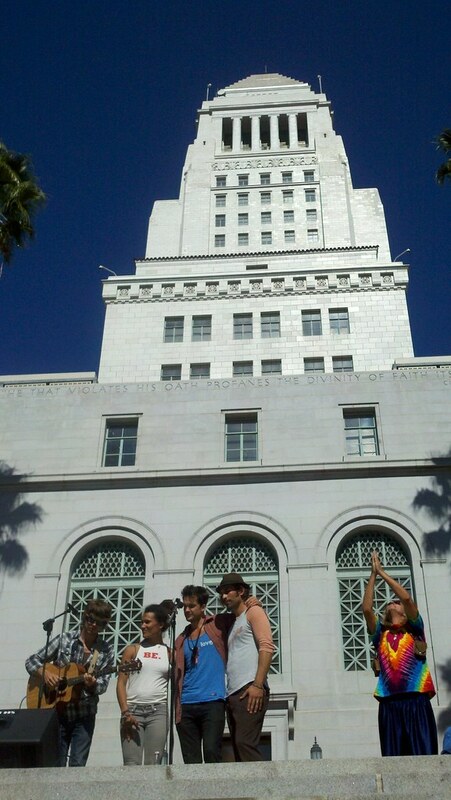 It began last Saturday with a spirited march of over a thousand people from Pershing Sq. to City Hall. 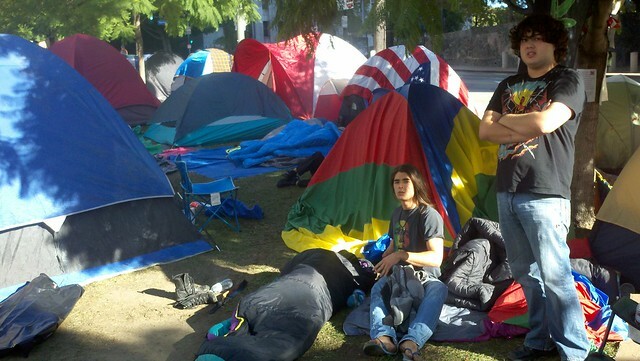 At city hall they pitched tents on the larger south lawn and held the first General Assembly of the occupation. As last weekend moved into the week days they were obliged to move from the south lawn to the smaller north lawn to make room for a movie shoot followed by a farmers market. This actually proved to be fortuitous because the small area made it look like more people than it did in the larger space but by Friday the north lawn was crowded with more than 120 tents and the occupation was running out of room. On Saturday they knew that they could move back to the north lawn but that didn't mean giving up the south lawn so now they have city hall surrounded with more than 60 tents already on the north lawn with no apparent diminution of the number on the north lawn. Occupy Los Angeles made the news on on the very first day because the tactic of stonewalling Occupy Wall St. was running out of time and the bust of seven hundred protesters on the Brooklyn Bridge gave them a story they could run with, but that meant they also had to cover Occupy LA locally from the beginning. After that there has been a steady stream of reporters and TV crews at the encampment. 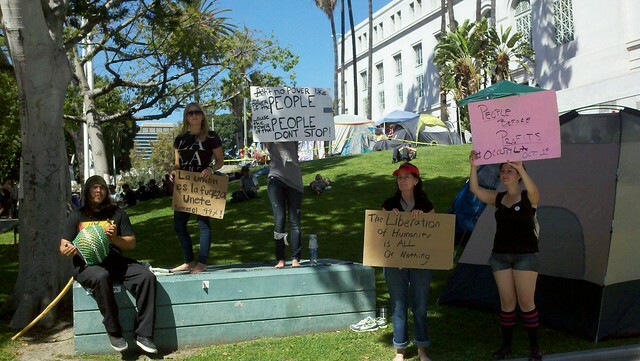 It has almost gotten to the point where a segment on Occupy LA was required for a comprehensive local news broadcast and national news has also been obliged to cover the protest. This has meant that the movement has gotten a lot of exposure in the greater Los Angeles area, and the response from the public has been amazing. City hall sit among four heavily traveled intersections and the honking of horns in support has been none stop. Around 5:30, when many committees have scheduled meetings it can reach a level that makes the meetings all but impossible. For many working people this Saturday is the first time they have been able to visit what the whole city has been talking about and the occupiers have planned quite a day for them. Saturday is also the first day that the protest is permitted. The lack of permit hasn't stopped us from camping on the grass or using a PA system to expedite the larger meeting but they have moved to the sidewalk at night as requested by the police, but the permit does allow them to get serious about amplified sound and music. 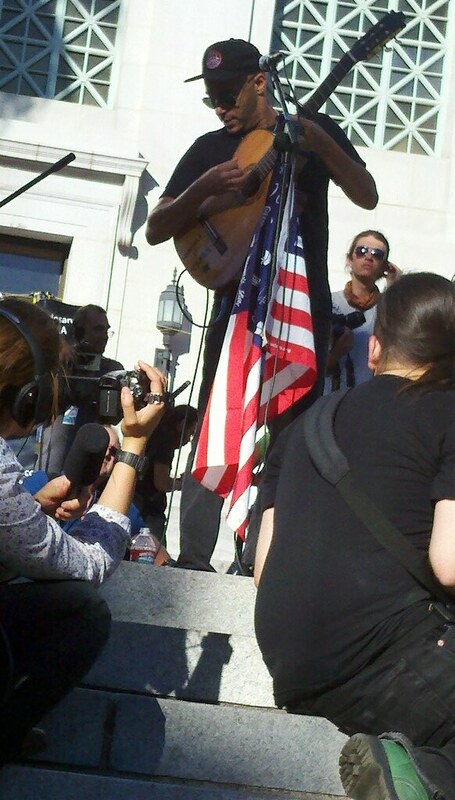 That allowed for musical concerts on the south steps of city hall in the afternoon, the highlight of which was a concert by Tom Morello of Rage Against the Machine. 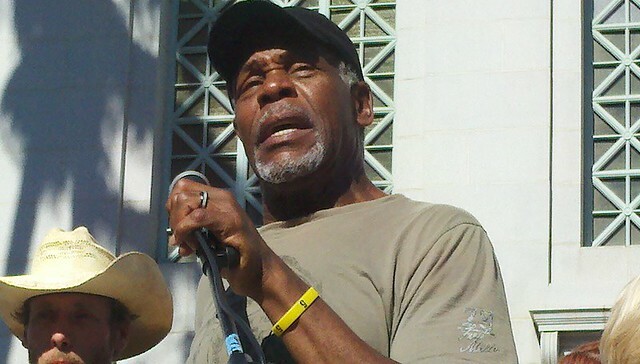 Before that Margret Prescott of KPFK introduced Danny Glover and friends. 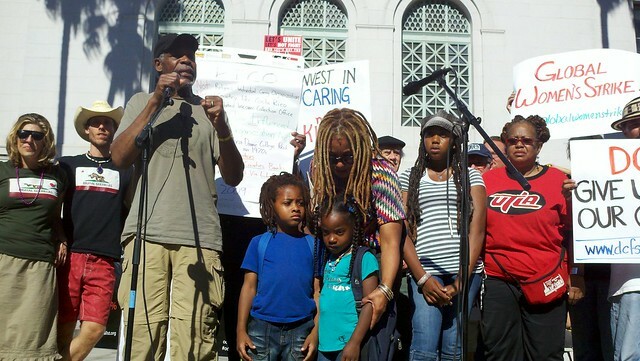 Danny Glover gave a rousing speech that had the crowd cheering, a crowd that had grown to several thousands by then. 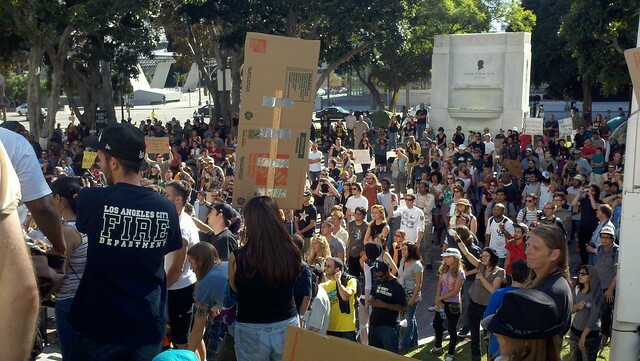 But the biggest event of this Saturday was the biggest General Assembly that Occupy Los Angeles has had to date. The result of all the work and struggle that has gone to refining the process in the last twelve Gas was tested tonight.